The Poseidon Adventure is a 1972 American disaster film directed by Ronald Neame, produced by Irwin Allen, and based on Paul Gallico's eponymous 1969 novel. It features an ensemble cast, including five Academy Award winners: Gene Hackman; Ernest Borgnine; Jack Albertson; Shelley Winters; and Red Buttons. Parts of the movie were filmed aboard the RMS Queen Mary. The plot centers on the fictional SS Poseidon, an aged luxury liner on her final voyage from New York City to Athens before being sent to the scrapyard. On New Year's Eve, she is overturned by a tsunami. Passengers and crew are trapped inside, and a rebellious preacher attempts to lead a small group of survivors to safety. It is in the vein of other all-star disaster films of the early-mid 1970s such as Airport (1970), Earthquake (1974), and The Towering Inferno (1974). By the end of 1974, it was regarded as a widely successful film. The film won two Academy Awards, a Golden Globe Award, a British Academy Film Award, and a Motion Picture Sound Editors Award. A sequel, Beyond the Poseidon Adventure (1979), also based on a novel by Gallico, was a critical and commercial failure. The S.S. Poseidon, an ocean liner slated for retirement, is on her way to Athens. Despite protests from the captain, who fears for the ship's safety, the new owner's representative insists he go full speed to save money, preventing Poseidon from taking on ballast. Reverend Scott, a minister who believes "God helps those who help themselves", is travelling to a new parish in Africa in essence as punishment for his unorthodox views. Detective Lt. Rogo and wife Linda, a former prostitute, deal with her seasickness. Susan and younger brother Robin are traveling to meet their parents. Robin is interested in how the ship works and frequently visits the engine room. Retired Jewish store owner Manny Rosen and wife Belle are going to Israel to meet their young grandson for the first time. Haberdasher James Martin is a love-shy, health-conscious bachelor. The ship's singer, Nonnie Parry, rehearses for the New Year's Day celebration. Passengers gather in the dining room to celebrate. The captain is called to the bridge in response to a report of an undersea earthquake. He receives word from the lookout that a tsunami is approaching from the direction of Crete at 60 knots (110 km/h). He issues a mayday distress signal. The ship is hit broadside and capsizes. In the dining room, survivors take stock of their predicament. Acres, an injured waiter, is trapped at the galley door now high above. Scott surmises that the escape route will be found "upwards", at the outer hull, now above water. Robin tells him the hull near the propeller shaft is only 1 inch (25 mm) thick. The Rosens, the Rogos, Susan, Robin, Acres, Nonnie, and Martin agree to go with Scott, using a Christmas tree as a ladder. After the group climbs to the galley, there is a series of explosions. As seawater floods the dining room, those remaining attempt to climb the tree, but their weight causes it to fall. The water fills up the room and the Poseidon begins sinking. Scott leads his group through the ship's hull toward the engine room. While climbing a ladder inside a ventilation shaft, the ship rocks from more explosions. Acres falls and perishes despite Rogo's attempt to save him. Leaving the shaft, the group meets a large band of survivors led by the ship's medic, heading toward the bow. Scott believes they are heading for their doom, but Rogo wants to follow them and gives Scott 15 minutes to find the engine room. Although he takes longer than allowed, Scott succeeds. The engine room is on the other side of a flooded corridor. Belle reveals she is a former competitive swimmer and volunteers to go through, but Scott refuses her and dives in. Halfway through, a panel collapses on him. The survivors notice the delay, and Belle dives in. She frees Scott and they make it to the other side, but Belle suffers a heart attack. Before dying, she tells Scott to give her Chai pendant to her husband, who will give it to their grandson. Rogo swims over to make sure Belle and Scott are all right, then leads the rest over. When Rosen finds Belle's body, he is unwilling to go on, but Scott gives him her pendant, reminding him that he has a reason to live. Scott leads the survivors to the propeller shaft room's watertight door, but another series of explosions causes Linda to fall to her death. A heartbroken Rogo blames her death on Scott. A ruptured pipe releases steam, blocking their escape. Scott rants at God for the survivors' deaths. He leaps and grabs onto the burning-hot valve wheel to shut off the steam, then tells Rogo to lead the group as his strength gives out, falling to his death. Rogo leads the remaining survivors—Rosen, Martin, Nonnie, Susan, and Robin—through the watertight doors and into the propeller shaft tunnel. They hear a noise from outside and bang on the hull to attract attention. The rescuers cut through the hull, assist the six survivors from the ship, inform them that no one else survived, and fly them to safety. The Poseidon Adventure has received largely positive reviews, with review aggregator Rotten Tomatoes reporting 79% of 24 critics gave the film a positive review, with an above average score of 7.1/10. Boxoffice magazine reported The Poseidon Adventure was the #1 Box Office Champ of 1973. By the end of 1974, it ranked among the six most successful features in film history, along with Gone with the Wind (1939), The Godfather (1972), Love Story (1970), Airport (1970), and The Sound of Music (1965). It is listed in Golden Raspberry Award founder John Wilson's book, The Official Razzie Movie Guide, as one of The 100 Most Enjoyably Bad Movies Ever Made. Roger Ebert gave the film two-and-a-half stars out of four and called it "the kind of movie you know is going to be awful, and yet somehow you gotta see it, right?" A. H. Weiler of The New York Times wrote that "though tensions slacken and credibility is strained here, realistic technical effects make the stricken ship and the efforts of its survivors to escape a fairly spellbinding adventure." Variety called the film "a highly imaginative and lustily-produced meller" with "some of the most exciting sequences seen in years." Gene Siskel gave the film three stars out of four and wrote that "the film's technical excellence—special effects, production design, and the stars doing their own stunts—holds one's interest." Charles Champlin of the Los Angeles Times wrote that "the special effects—the genuinely remarkable production values and technical wizardries—sweep everything else aside. Are the characters as gaudy and thin as cereal boxes? Is the dialog banal and shrill? Is the moralizing heavy-handed and relentless? Is the hokum a bit thick even in the context of a showmanship special? Well, yes. But who cares?" Gary Arnold of The Washington Post wrote that the film was "strictly formula hokum, but reasonably diverting if one doesn't ask for more than the filmmakers care to give—that is, for imaginative writing and direction. As usual, only the special effects and set designers and the stunt men have been permitted to be playful and creative." It is in the vein of other all-star disaster films of the 1970s such as Airport and later ones like Earthquake (1974) and The Towering Inferno (1974). The film earned estimated rentals of $40 million in North America in 1973. Mad's September 1973 edition satirized the movie as "The Poopsidedown Adventure". It became the best selling issue in the magazine's history. When the film made its network television premiere on ABC on October 27, 1974, it earned a 39.0 household share, making it the sixth highest film to ever air on network television. The Poseidon Adventure has become a cult film, particularly among gay audiences. It has been released on DVD and Blu-ray. The film won a Special Achievement Academy Award for Visual Effects and an Academy Award for Best Original Song (for "The Song from The Poseidon Adventure", also known as "The Morning After"). Shelley Winters won the Golden Globe Award for Best Supporting Actress – Motion Picture and was nominated for the Academy Award for Best Supporting Actress for her role. It also received nominations for the Golden Globe Award for Best Motion Picture – Drama and for Best Original Score by John Williams. A 1979 sequel, Beyond the Poseidon Adventure, which was also based on a novel by Gallico, was released later with an equally star-studded cast, but was a commercial and critical failure. In 1998, several episodes of the daytime soap Sunset Beach entitled "Shockwave" revolved around an earthquake and tsunami in California and major parts of the episodes take place on a cruise ship, the S.S. Neptune that is capsized by the giant wave. The episode borrowed heavily from the plot line of The Poseidon Adventure and garnered huge audiences and spurring NBC to repeat it several weeks later in prime time. 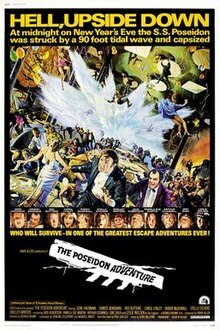 The Poseidon Adventure has been remade twice, first as a television special in 2005 with the same name and as a theatrical release titled Poseidon in 2006. ^ "The Poseidon Adventure, Box Office Information". The Numbers. Retrieved 2012-01-21. ^ "NY Times: The Poseidon Adventure". The New York Times. Retrieved 2008-12-28. ^ Ebert, Roger (December 21, 1972). "The Poseidon Adventure". RogerEbert.com. Retrieved 2018-12-17. ^ Weiler, A. H. (December 13, 1972). "Screen: 'Poseidon Adventure' Arrives". The New York Times. 61. ^ "Film Reviews: The Poseidon Adventure". Variety. December 13, 1972. 15. ^ Siskel, Gene (December 22, 1972). "Escapism is in season over on State Street". Chicago Tribune. Section 2, p. 1. ^ Champlin, Charles (December 14, 1972). "Survival Struggle on the Poseidon". Los Angeles Times. Part IV, p. 1. ^ Arnold, Gary (December 27, 1972). "'Poseidon Adventure' Diverting". The Washington Post. B1. ^ The Complete Directory to Prime Time Network and Cable TV Shows 1946-Present. Ballantine Books. 2003. p. 805. ISBN 0-345-45542-8. ^ Vinciguerra, Thomas (2006-05-07). "Underwater, and Over the Top in 1972". The New York Times.